Today's post is long overdue and a part of my spring cleaning on this blog. Let me start by apologizing to those who have been asking for this tutorial for a while. There are so many tutorials out there that I thought nobody would really care about how we planked our walls! Truth be told, we are the "fly by the seat of our pants" sort of DIYers. Usually I get some crazy idea and then Billy and I both do a bit of research on how we can accomplish it affordably. I fell in love with planked walls long before the HGTV Fixer Upper shiplap explosion. 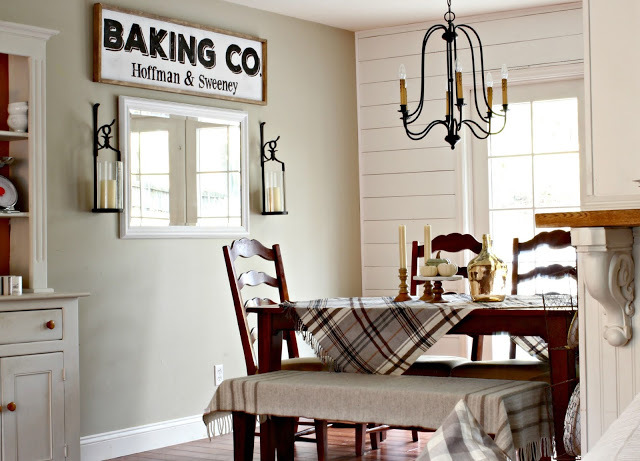 I think the first planked walls I saw that made me consider adding some to my home belonged to Layla from The Lettered Cottage. I just adore Layla's style (who doesn't, right?)! 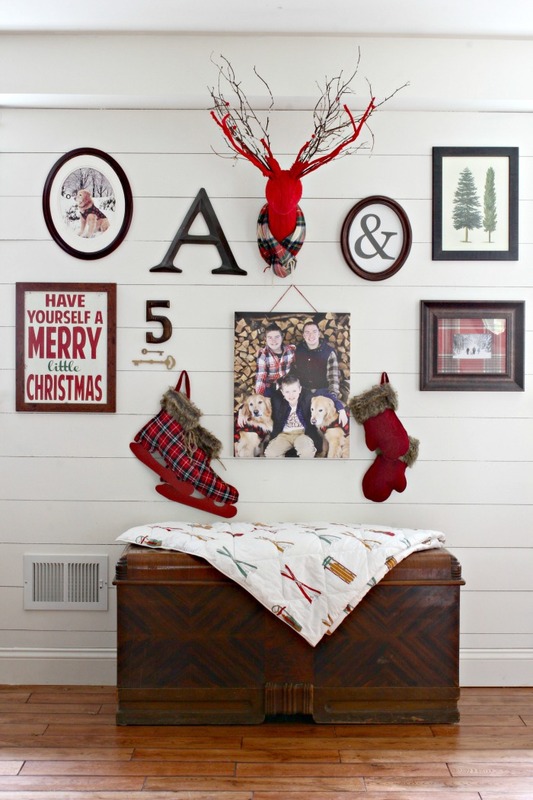 I loved the way they looked in a cottage, but could I really add them to a 1950's split level?? Well, we did. And we love it. And as my husband has told me time and again, there is always spackle if I change my mind. We have removed more than our fair share of paneling and wall paper in our own 3 fixer uppers, so removing this wall planking wouldn't be the end of the world. The good news is, I don't plan on removing any planking anytime soon. Instead, I keep visualizing places to add it. Anyway, I refer to ours as wall planks because they are indeed planks of hardboard tempered paneling. Paneling sounds so outdated and 1970's, doesn't it? It is definitely true that everything old becomes new again! They started out as large sheets of paneling that we cut down into long strips. 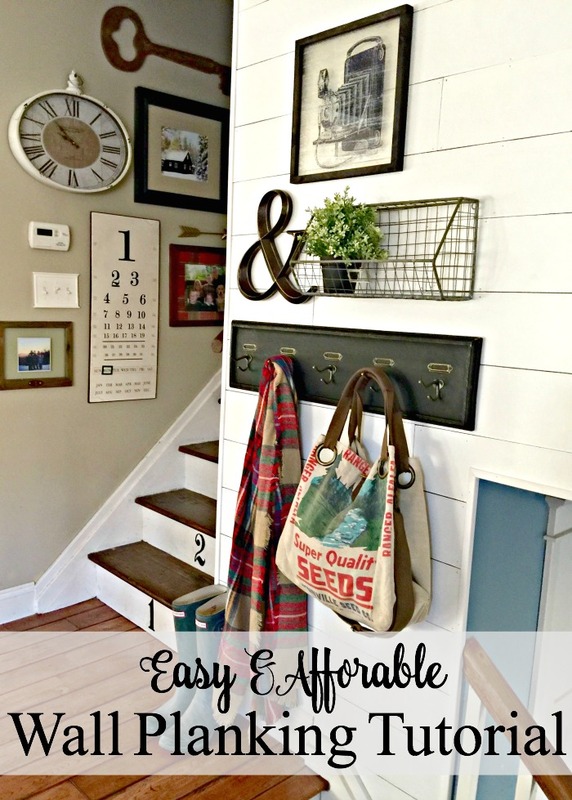 We did the math in the aisle at our local Home Depot and figured out that using the large pieces of paneling was the cheapest most affordable way to get the look we wanted. They sell wood tongue and groove shiplap in the big box stores now, but the wood shiplap was more than we wanted to spend. Also, the wood would have added a much thicker layer to our walls and since our trim was already finished, we preferred not to have to take it down and re-do it. The hardboard paneling was thin enough to run up to our thicker trim. The hardboard panels now cost $14.52 each (they were a bit cheaper way back when did this project) at Home Depot and we used 5 sheets to plank the wall in our family room. We were very pleased with how affordable it was to add so much charm to our house! So we started with 4' by 8' sheet of hardboard tempered paneling from Home Depot. Note, I cannot link to the direct product on Home Depot's website, but if your search for 4x8 hardboard tempered paneling, it should show up. It is Model # 832780. It should cost somewhere around $15 depending on your location. Billy cut this sheet down into 6" wide planks with his circular saw. To do this, he measured and marked 6" from the long edge of the paneling in several spots. Next, he clamped down a 2x4 to the paneling, lining it up with his measured 6" marks, to use as a guide for his saw. I have read that both Home Depot and Lowes may cut these down for you so it definitely worth asking if you don't want to cut them yourself. Then, starting from the bottom, he nailed them to the wall using small 1 1/2 inch 18 gauge nails. He didn't use any glue. 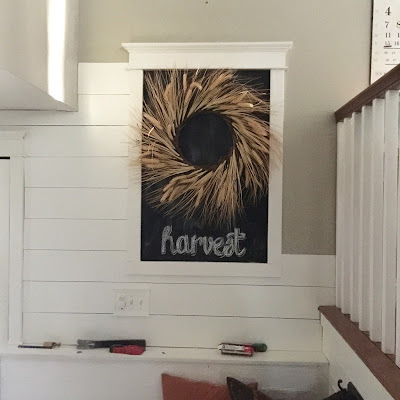 For the gallery wall in our family room, we then filled all of the nail holes with wood filler and primed and painted (paint color is Behr Swiss Coffee). It was a bit of a pain because the paint keep globbing up a bit between the planks. 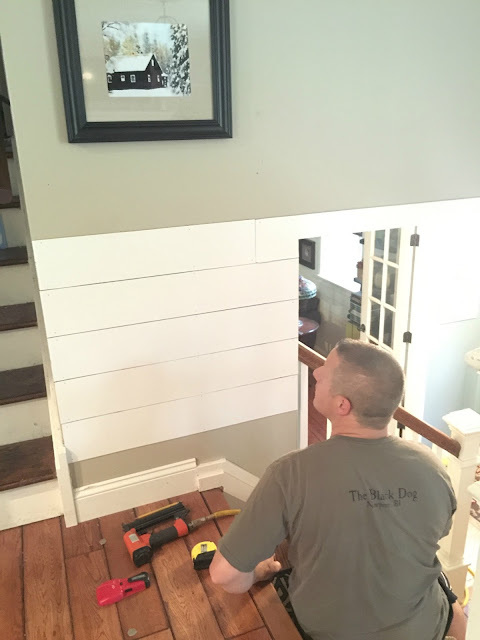 When we did the planked walls in our living room and entryway, we primed and painted the MDF planks before we put them on the walls. I think it worked out better that way. We didn't fill the nail holes on these planks. I actually prefer how rustic they look with the small holes. If you prefer a more polished look, you could fill the holes and touch up paint over them. This wall was a bit more challenging because we couldn't start on the bottom because we were lining the planks up with the adjacent wall, which starts down in our entryway. It is definitely easier to do just a single wall for your first project. The last step was to add some trim where the planks met the ceiling and also on the corners. We used a simple quarter round molding by the ceiling and a basic corner molding on the corners. The molding aisle is one of my very favorite aisles in Home Depot. I did my best to try to explain how our crazy minds work when it comes to our DIY projects. For our next planking project, I would love to do a ceiling. Our DIY philosophy is definitely to give things a try, even if you aren't so sure exactly how to do it. And even if it doesn't come out as "perfectly" as it would have if it were done by a professional. Perfect is overrated anyway. Have fun and happy planking! LOL, yup trial and error is our "method"!! I am glad you asked ;) I hope this helped a bit! Hi Lou. Unfortunately I do not have a picture. It is ugly!! lol. 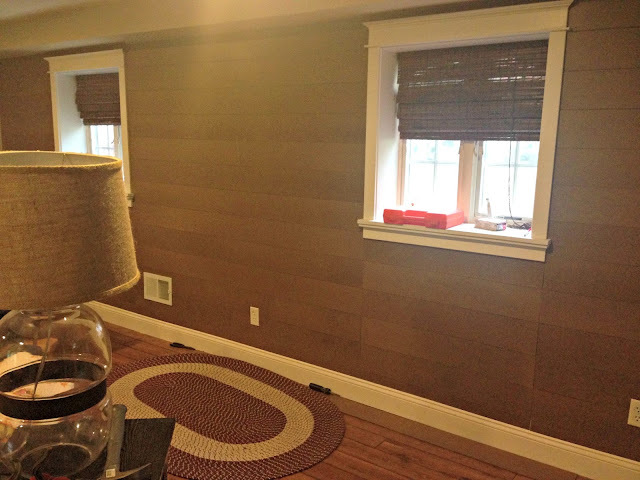 Just a large 4ft by 8ft sheet of brown paneling that looks nothing like shiplap. I just realized Home Depot keeps routing my links back to their main website and I can't change that. Frustrating! If you search for 4x8 hardboard tempered panel or Model # 832780, it should come up. Good luck and let me know if I can answer any more questions. Your link worked just right for me! Goes right to the paneling. Thank-you so much, we were just going to start some planking in our home. Love your blog, its truly a bright spot. I tend to think more after I've started a project than before but I think if I thought too much I would never get started. It looks great and now I'm inspired to add some here. How did you cut the pieces to go around your window trim, especially towards the top of the trim where it looks tricky? Hi Jennifer. My husband made those cuts with a jigsaw. 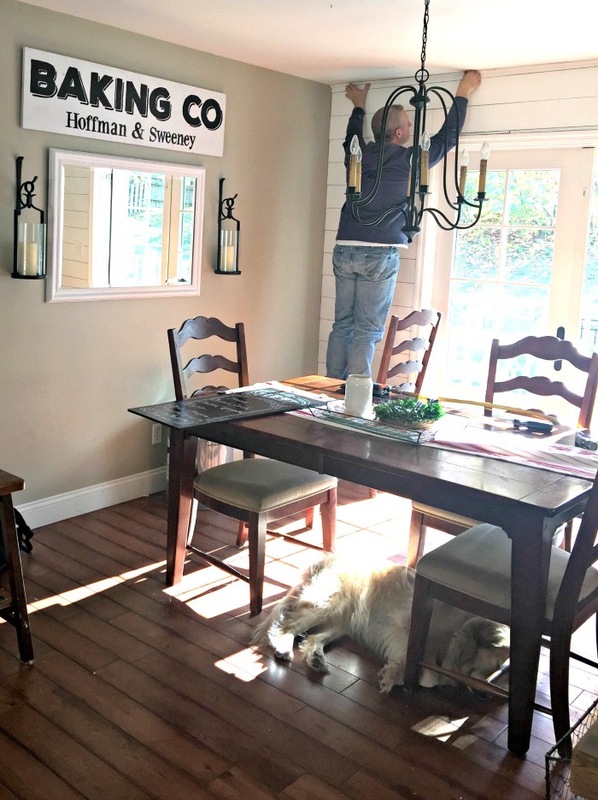 It is much easier of you don't have the trim already installed like we do. If we didn't have the trim, those would just be straight cuts. PLEASE tell me where you bought that chandelier?? ?